I don’t know about you, but I’m ready to bring on the summer! This includes longer days, more time outside, and of course, summer scented body products! It’s not enough that a product smells great. It also has to get the job done, which is why I’m so happy to have tried out some products from Miz Magickal! Lisa, the owner, was kind enough to send me her Whipped Body Butter and Lip Balm to review. Miz Magickal is a new company based on positive energy, meditation, peace and serenity. All products are free of emulsifiers, parabens, and phthalates, and the lip balms are beeswax free! YESSS! Save the bees! I chose the Whipped Body Butter in the Sweet Orange and Vanilla Scent (2 oz.). This product hits your nose with notes of sweet citrus and leaves behind the scent of vanilla and cocoa butter, along with a subtle sheen/glow on the skin. It is the consistency of a thick mousse and is easily worked into the skin! So… this body butter passed the fragrance test, but did it actually work?? For the ultimate test, I used this on my legs right after shaving and on my always dry, and not so cute, footsies. I am happy to report that my legs are as soft and smooth as (body) buttah!! My feet look and feel wayyyyyy better after just a few uses! 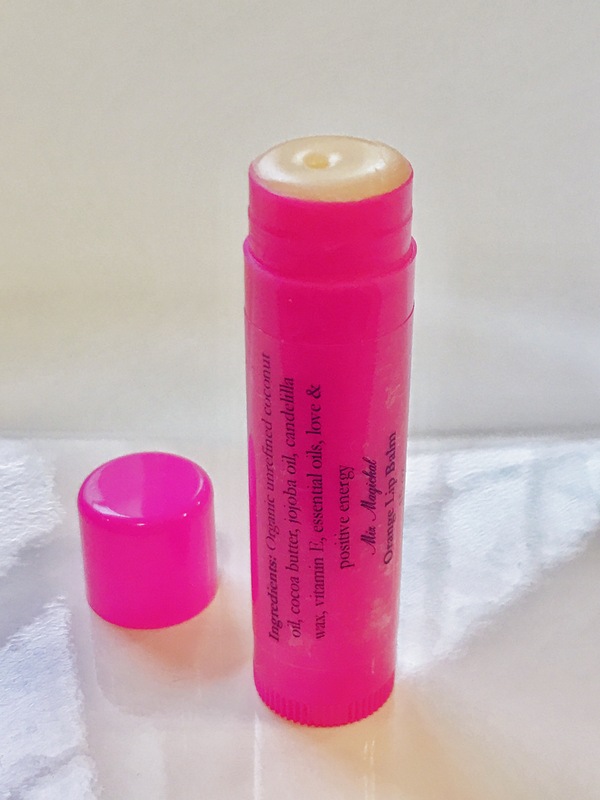 The Orange Lip Balm (.15 oz.) comes in the CUTEST bright pink tube and I absolutely love it! It has a very similar scent to the Body Butter, with sweet notes of citrus, organic coconut oil, and cocoa butter. This balm glides on easily and leaves behind a subtle shine, perfect for when you don’t want to fuss or when when you want to pull a look together. It is not sticky or tacky in the slightest, so you don’t have to worry about your hair getting stuck in it on a windy day (Hooray!). I put this on before bedtime, and my lips were noticeably softer. It’s a winner in my book! So, if you’re looking for vegan and cruelty-free products that are effective and made from good people, give Miz Magickal a try! Check out her newly launched website to see all of her available products, and follow her on Instagram @mizmagickal!